I'm participating in the following Friday Follows this week. Welcome new friends! hi. you have a lovely home here, and i found you through friendly friday follow. i'm following, and i hope you can follow me too :). i'm a new follower. your son is adorable!! 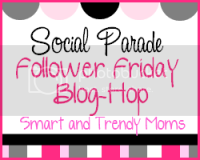 Thanks for linking up with me at Smart and Trendy Moms for our Social Parade, I am totally following and hope your a follower of mine as well! Hi! I'm a new follower! AND I live in Valley Stream, NY! Follow me at http://www.yesmommythequeen.blogspot.com. I love all things with the word Queen in it. I'll link up. Do the same. Take care! Hi Thanks for stopping by my blog following you now too. Your little boy is so cute! Hello, thanks for linking up. Your son is adorable. It'll be gr8 to share notes about the boys:). Am following you back. Cheers!! Hello! Thanks for the sweet follow :) I am following you back as well - Enjoy your weekend! Super cute blog and even more super cute lil boy! Thanks for following. I am obviously your newest follower:) In regards to your comment on my post, I don't know what the hell is taking so long to stop this spill. I agree with you that its a lack of interest on the part of BP. They are more interested in salvaging the oil rather than the earth. What does that say about what kind of company they are? Shame shame on them! On another note, I have a question for you ( since I am a Midwesterner) what exactly is a borough? I am being serious..I've always wanted to know and since I have an actual real live New Yorker at my disposal, I thought it would be apropos to ask:) Thanks again for following! Happy Mothering!